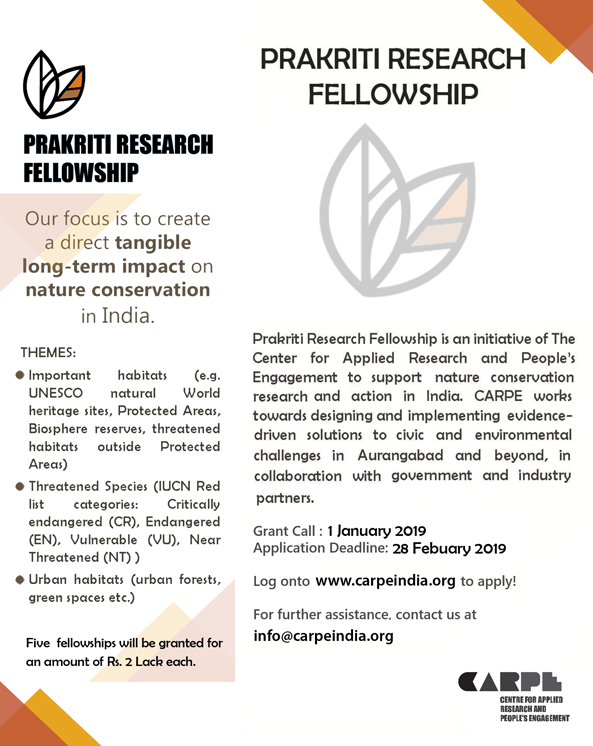 The Prakriti Research Fellowship is an initiative of The Centre for Applied Research and People’s Engagement (CARPE). It is a small grants programme initiated to support nature conservation and action with a focus to create a direct tangible long-term impact on nature conservation in Aurangabad and beyond started in 2018. This program was born out of the need as identified during research into the Green Aurangabad Mission. Sponsored by various industry partners, the fellowship aims to provide seed money for strong on-ground work done by individuals, teams, and small NGOs in this field. Aurangabad, Nanded, Beed, Jalna, Latur, Hingoli, Parbhani and Osmanabad districts). Maximum of ₹ 2 lakh per project. One candidate/organization can apply for one fellowship only. For detailed notification, click here and for official website, click here.